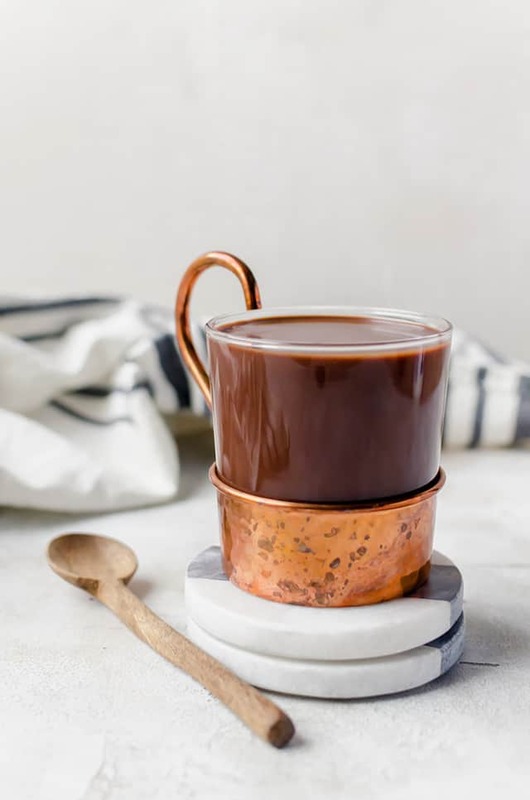 It’s that time of the year where we crave mugs of homemade hot cocoa. 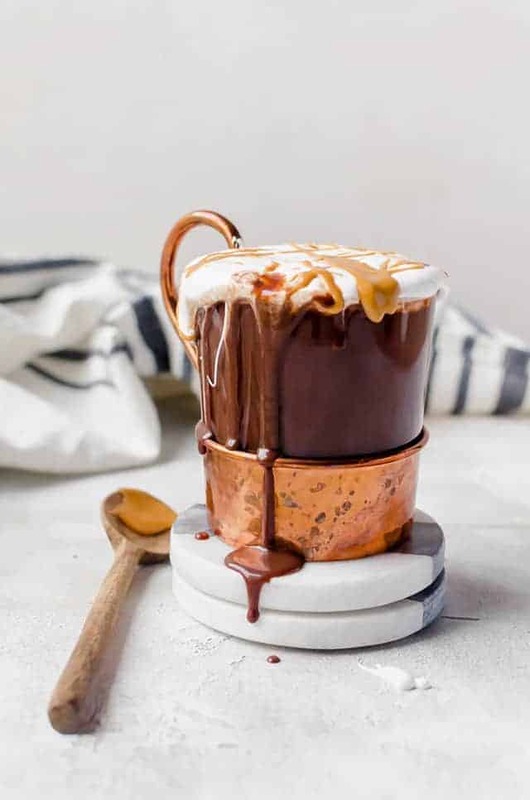 This fluffernutter hot cocoa is thick and creamy. It’s topped with a marshmallow creme or as I call it marshmallow fluff. It’s the perfect recipe for all peanut butter lovers! We were standing outside last night watching the town’s Christmas tree light. It was so chilly out and all I could think about was wrapping your hands around a warm mug of fluffernutter hot cocoa. That’s right. Hot fluffernutter cocoa. Chocolate + peanut butter + marshmallow creme = the creamiest and most magical cocoa in town. You’re welcome! I seriously debated on whether my hot fluffernutter cocoa was too creamy. Yes. TOO creamy. Well, Wesley and Lucian have informed me that it’s perfect and also the best. They may be biased. I can’t say for certain. I’ve never had chocolate soup, but have read a few dessert cookbooks with recipes for it. 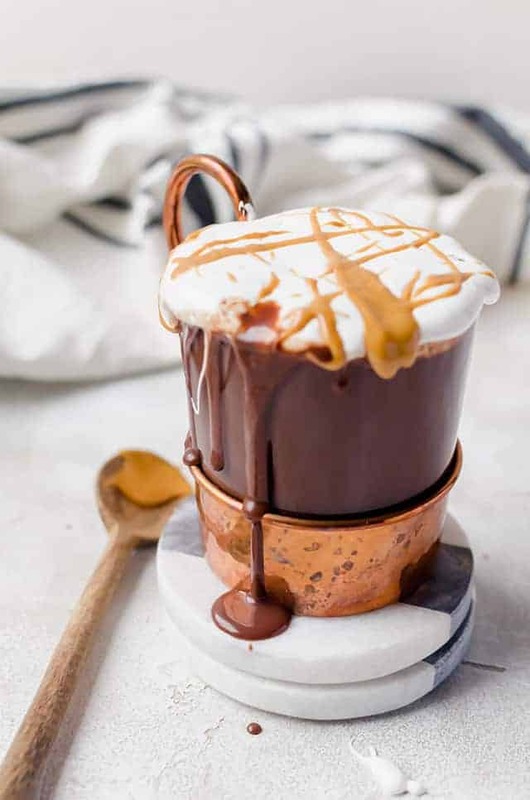 I feel like my fluffernutter hot cocoa could almost be thrown into a soup bowl and called a fluffernutter chocolate soup, but drinking it out of the cup is so much easier. In a panicked state, Wesely started asking me if I actually wrote down the recipe. I have a habit of not writing down my dinner recipes that I throw together. He will find something that he loves, most of the time it’s my soups and I’ll have no idea how much of anything I put in it. In this case, it was a recipe for my blog. Of course, I wrote this one down. A sigh of relief was sounded after I reassured him that it was indeed written scribbled down in my notebook. Mix cocoa powder and sugar together in a saucepan. This helps break apart in lumps of cocoa powder. Add in chocolate chips, peanut butter, heavy cream, and milk. Heat and whisk until the fluffernutter hot cocoa is smooth. 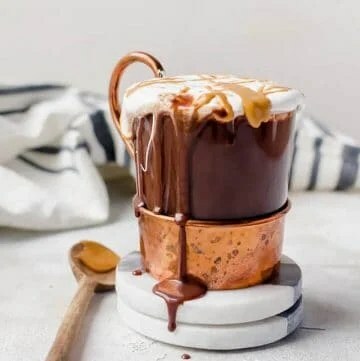 Pour into mug and top with marshmallow creme and melted peanut butter. It kind of reminds me of The Santa Clause movie. Judy the elf has the perfect recipe for hot cocoa that took her 1200 years to get right. That’s me. I’m Judy. It took me a week to concoct the perfect hot cocoa. In a medium saucepan, add in the cocoa powder and sugar. Whisk until all the lumps are out of the cocoa powder. Add in the white chocolate chips, peanut butter, heavy cream, and milk. Turn the heat on to medium. Whisk to start to incorporate the ingredients. It will come together as the liquid begins to heat up. Let the hot cocoa heat until it's almost to a boil and small bubbles form around the edges of the saucepan. Whisk vigorously until the hot cocoa is smooth. Remove from the heat and pour into 2 large mugs. Place about 2 tablespoons of fluff on top of each mug. Place the 1/4 cup of peanut butter in a microwave-safe bowl. Microwave for 30 seconds. 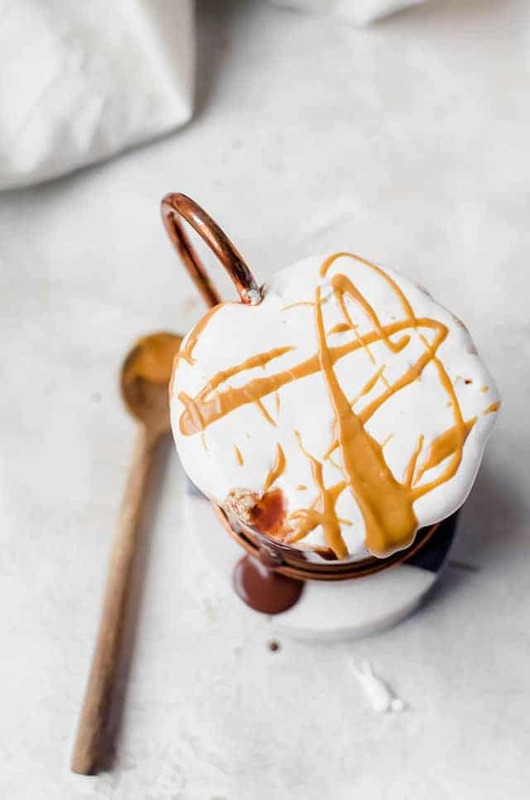 Using a spoon, drizzle the peanut butter over the fluff. Grab a spoon and give it a swirl. Drink up! If you feel that the recipe is too rich, feel free to add an additional cup of any kind of milk. Thank you! It is pretty delish. It makes for a great chocolate ‘stache too! Looks absolutely delicious! Pinning for later! Thank you! It is delish! This looks soo decadent! YUM! oh my gosh, this sounds amazing. i love fluffernutter and hot cocoa so this is right up my alley! This is such a great idea! I love fluffernutter! I would love to curl up with a hot cup of this cocoa! I could definitely go for a steaming mug of this right now! It looks awesome! Thanks so much for sharing it with us at Foodie Fridays. I’ll be sharing this yummy treat on my Facebook page tomorrow! Stumbling it too!